You've spent time poring over the internet, searching for the perfect gift to no avail, so why not let the stars decide? Since women under each zodiac sign have a style uniquely their own, this gift guide makes it easy to find exactly what will make them feel super special. From cosy sweaters to eye-catching accessories, these are gifts that will make your good list, we promise. While you may be looking to the stars for gift inspiration, fret not. These horoscope-approved gifts are sure to please even if she's not a strict believer. So whether you're shopping for your sister, S.O., or BFF, let the world of astrology offer you a little bit of assistance—it's destiny, after all. Added bonus: Since we're breaking down why each gift makes the right choice, you'll have a quick response at the ready when she asks how you knew. 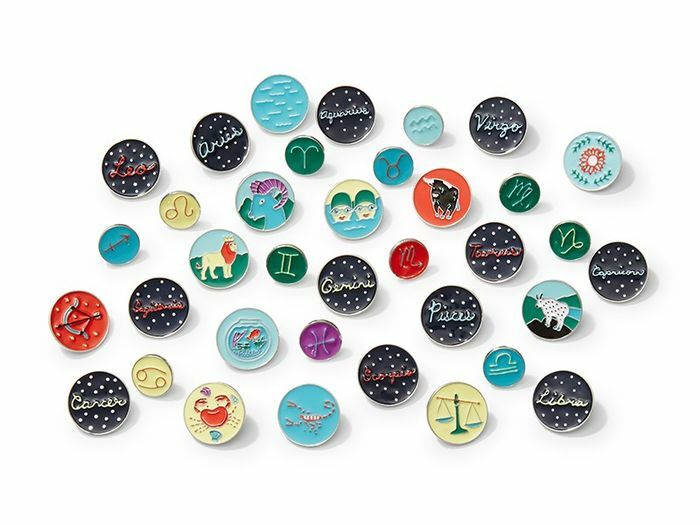 Read on to see the best gifts inspired by the zodiac. Capricorns are sophisticated, but they like to keep things simple. When hunting for the perfect gift, think effortless but luxe like this cashmere sweater. If you're shopping for an Aquarius, you'll want to think bold. They love color and dig anything creative, which is why these patches are a sure win. Romantic Pisceans are drawn to pieces with a little bit of bohemian flair. A skinny scarf is an outfit addition that this star sign will love. Chances are an Aries is the trendsetter of any group. They are confident in their style, and they love to make a statement. A pair of statement earrings is a winning choice. For a Taurus, the perfect gift is one that's cool but will also stand the test of time. Sleek sneakers will offer them comfort while still feeling fresh. Available in sizes 7.5 to 9.5. Geminis could easily pull off just about anything, and they love to mix up their style, especially with accessories. A cool contrasting pair of socks fits their fluid style just right. A little bit feminine but still all about keeping things comfortable, Cancers crave pieces that look great but work for hanging out at home. A pretty bralette is delicate but can also survive a date night with Netflix. Ah, Leo, a fearless zodiac sign that loves to make a statement. A colorful phone case is just the piece she needs, especially if it's paired with her favorite eye-catching outfit. Youthful but with a classic twist, Virgos love pretty accessories. Consider a sculptural barrette that feels chic but unstuffy. Part of what works for a Libra is that she can mix and match like a pro, even when bold prints are involved. Treat her to a pair of statement flats and she'll pull them off with everything. Shopping for a Scorpio can be tricky since she has a uniform she loves—and she sticks to it. A simple, sleek card case will fit right in with her streamlined style, so don't fret. While you might use the word polished to describe the style of a Sagittarius, stuffy would never enter the lexicon—which is why she can pull off a pretty accessory like a beret as no one else can. You've got the gift—want something for yourself? Shop winter's biggest trends!